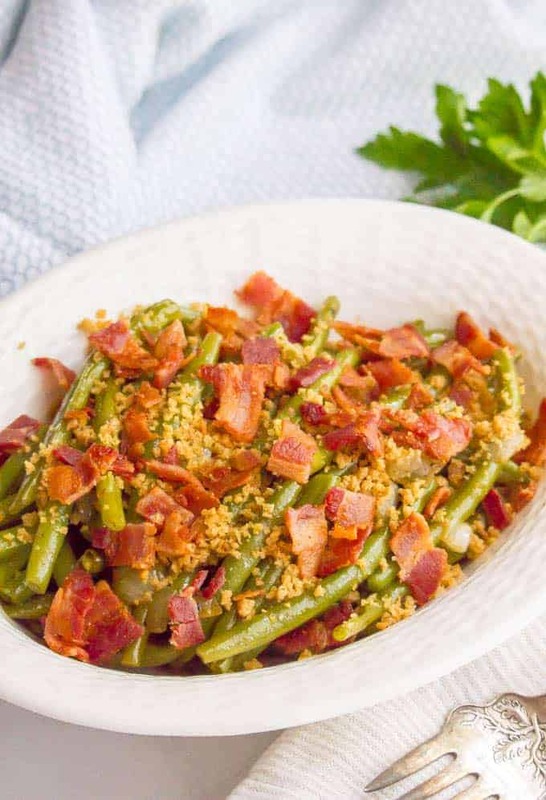 Southern style green beans with bacon and buttery breadcrumbs are just 5 ingredients but packed with so much flavor! 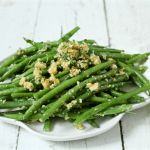 The soft, tender green beans are served with crispy, crumbled bacon and crunchy, golden brown breadcrumbs for a delicious dinner side dish! We had a fun, relaxed weekend complete with a petting zoo birthday party, an afternoon at the pool and another afternoon at the ballpark for a baseball game. It was all kinds of fun and all kinds of refreshing, which has me revived and ready to tackle another week. Which is good, because here it is upon us somehow. And it’s looking to be a busy one, and I have a possible jury duty thrown in the mix. We’ll see how this goes… but on to the FOOD! Today’s recipe is one I’ve been making on repeat! I’ll be the first to say that green beans are not my favorite vegetable. True, that’s not really saying much since I’m a HUGE veggie fan and happily shovel as many veggies in as possible. But what it also means is that I’m always finding new delicious ways to enjoy green beans. And these Southern style green beans with bacon and onions and buttery breadcrumbs are my new absolute favorite! The green beans are cooked slow and low to get super tender, gaining flavor from the bacon grease and onions. Plus, I mean, bacon. Automatic flavor booster. 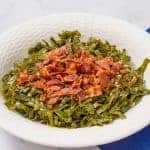 I will say, these bacon green beans are a recipe that uses the Southern-style of cooking green beans, where you “cook them to death,” as my parents say. Most people seem to either like them this way or else like them just barely cooked, when they still have a bit of crispness to them. I’m a little bit of a strange duck because I really do like them both ways, depending on the recipe. 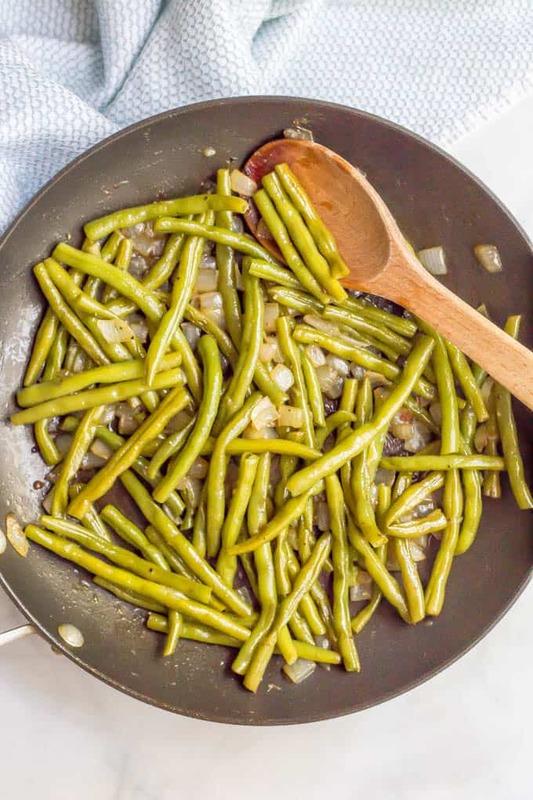 This recipe definitely requires the cooked-to-death style of soft, tender green beans, so it’s for all of you who love them this way. Cutting the bacon in half helps to fit more in the pan and also to cook it more evenly. You could also cut them into small pieces with some scissors, just snipping them into the pan. I use and like thick-cut or center-cut bacon. 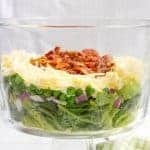 The bacon adds sodium to this dish, so go easy when you season the green beans with salt and pepper. I’m a huge onion fan, so I love the flavor that they add, but you could omit them if you prefer. The grease from the bacon and the steam from covering the pan to cook the green beans helps to ensure that the pan has plenty of liquid and doesn’t dry out. I know toasting the breadcrumbs is an extra step (and an extra pan) but it really adds so much flavor and extra crunch. I highly recommend you don’t skip this part. 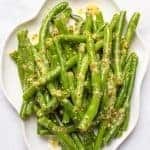 Whether you are just looking to jazz up your green beans or you’re trying to get your family to eat more vegetables, I hope you give these a try. And don’t miss my VIDEO for this recipe! 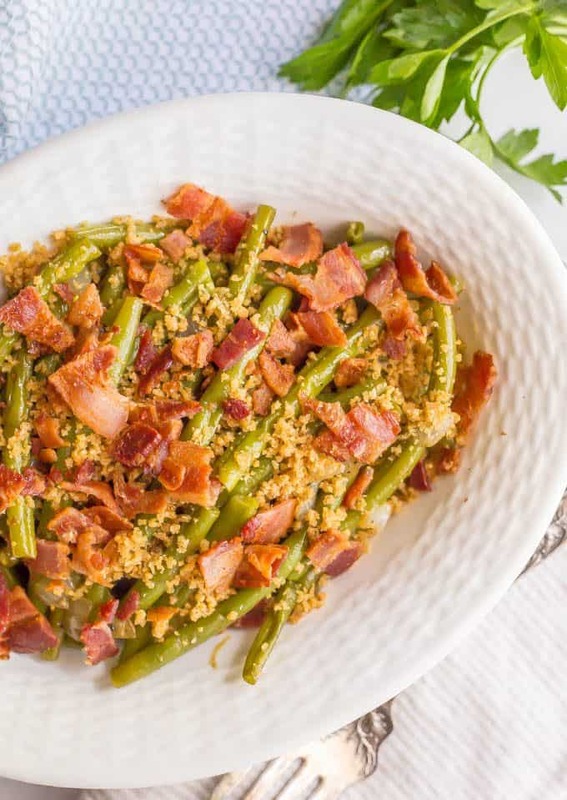 Green beans with bacon and buttery breadcrumbs are just 5 ingredients but packed with so much flavor! Heat a large skillet over medium heat and add bacon in a single layer. 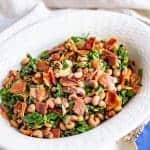 Cook until bacon is cooked through and crisp, turning when needed. Remove bacon to a paper towel to let cool, then crumble. Add chopped onion and green beans to the pan with the bacon grease and stir well to coat. Then cover, reduce heat to medium low and simmer for 20-25 minutes, until very tender. When the green beans are almost done, melt butter in a separate small skillet over medium low. Add breadcrumbs and cook for 4-5 minutes, until breadcrumbs are golden brown and crunchy, stirring frequently. 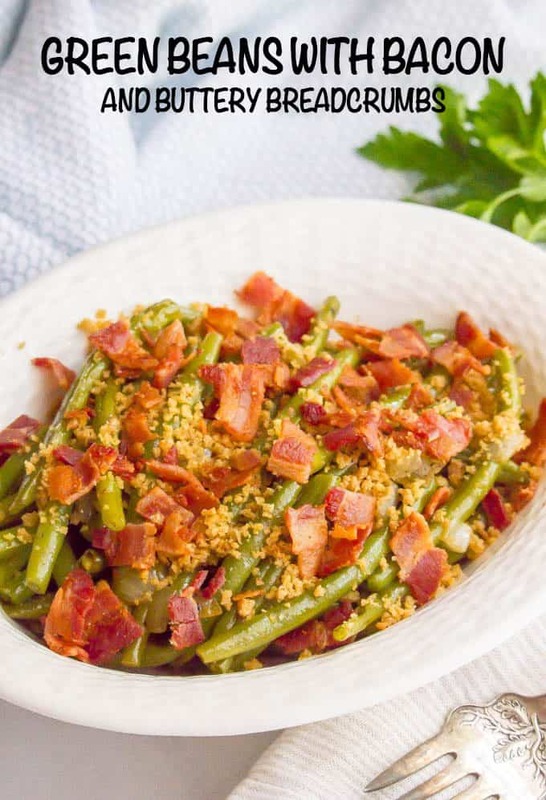 Serve green beans sprinkled with the breadcrumbs and crumbled bacon. Cutting the bacon in half helps to fit more in the pan and also to cook it more evenly. You could also cut them into small pieces with some scissors, just snipping them into the pan. I use and like thick-cut or center-cut bacon. I love onions and the flavor they add, but you could omit them if you aren’t a fan. This looks really good! I would love to give it a try! I hope you do! 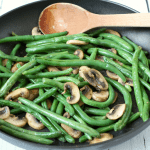 It’s one of my very favorite ways to eat green beans!